Once again, it is instructive to compare the account of Yahweh’s appearance to Solomon as recorded in 1 Kings 9 with the account we find in our reading from today in 2 Chronicles 7. In 1 Kings 9, Yahweh swore that he had consecrated the temple by putting his name there, and that he would establish Solomon’s throne forever if Solomon unfailingly kept Yahweh’s statutes and his rules (1 Kgs. 9:5). On the other hand, if Solomon or any one of Solomon’s offspring did turn from following him, then Yahweh would not only cut off Israel from the land but he would also destroy the temple (1 Kgs. 9:6–9). The Chronicler includes both of those sections in 2 Chronicles 7, but he also includes this section that was omitted from 1 Kings 9: “When I shut up the heavens so that there is no rain, or command the locust to devour the land, or send pestilence among my people, if my people who are called by my name humble themselves, and pray and seek my face and turn from their wicked ways, then I will hear from heaven and will forgive their sin and heal their land. Now my eyes will be open and attentive to the prayer that is made in this place” (2 Chron. 7:13–15). In context, this additional statement is an acknowledgment of the eventual reality that Israel will, in fact, fail. In 1 Kings, there was a tension in the narrative, where the reader would be wondering, Can they really do this? Can they remain faithful to Yahweh perpetually? The books of Chronicles, however, acknowledge from the beginning that Yahweh’s people would fail and that they would all be carried away into exile because of their breach of faith (1 Chron. 9:1). So, the books of Chronicles have pointed forward to the greater Son of David to come, the Messiah who would save Yahweh’s people. 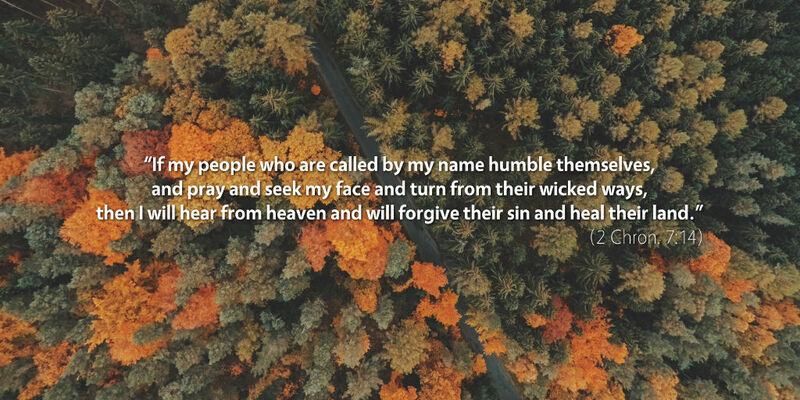 Here, however, we also learn a new facet of Yahweh’s plan: although it is the coming of the Messiah who will fully accomplish salvation for Yahweh’s people, the role of the people in embracing that salvation will be to humble themselves, pray, and turn from their wicked ways—that is, to repent. And indeed, this is the message of the gospel: now that Jesus has accomplished our salvation, he now commands us to humble ourselves, pray for his forgiveness, and repent from our wicked ways as we bow before his kingship. And if we do, then he promises not only to forgive us but to heal our land—that is, to grant to us an inheritance in the new creation that he is ushering in, so that we will dwell with him forever in a new heaven and a new earth. Therefore, repent and believe upon the Lord Jesus Christ, that you may be saved.